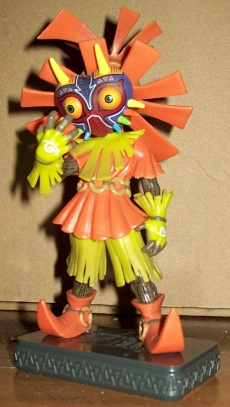 But enough about Jason Voorhees, let's talk about Majora's Mask 3D! That's right, folks. 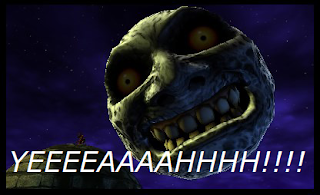 The much anticipated remake of The Legend of Zelda: Majora's Mask is finally here! It's no secret there's little love for this game amongst KoopaTV's staff, for various reasons, but in an effort to bring you more of that "fair and balanced" malarkey, here's an article from my own viewpoint. This will be a casual look at the game's release, which includes comparing the European and North American releases as well as examining the quality of the various pre-order bonuses. So imagine how further gobsmacked I was to learn that Europe would be getting an exclusive special edition. Pretty damn stoked, I can tell you. In due time, a special edition was announced for North America as well, giving both regions their own little bundles. 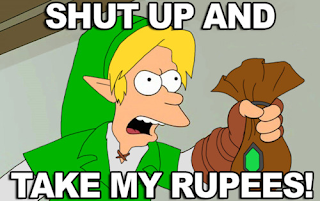 Add in the announcement that a limited edition Majora's Mask New 3DS XL (hereinafter abbreviated to MM N3DS XL) was also on the horizon, and you've got a recipe for a dire wallet-emptying. Yes, Nintendo's really been gearing up for this release with a whole slew of limited edition stuff. Nice to see they're treating this game's revival with some fan-fare. 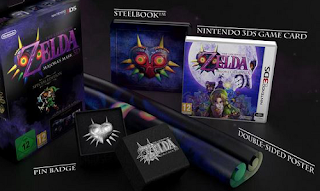 Interestingly enough, the original release of Majora's Mask also had a limited edition available exclusively in Europe, albeit limited to 1,000 pieces. Don't feel bad if you've never heard of it. While I don't endorse pre-order culture and was glad to see renewed attempts earlier this year to inform others of its detrimental effect on the industry, I feel the issue mainly concerns games we know virtually nothing about being hyped beyond reason and whether or not they'll even be at an acceptable standard by the time they come out. Therefore I make exceptions to pre-ordering games for: remakes or re-releases of old games, and games from a developer or series (Ace Attorney for example) trusted for their record of quality. Both apply in this case. 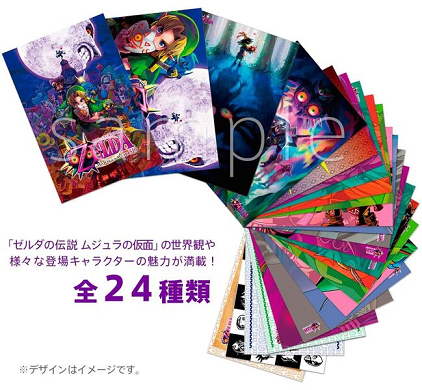 Here's what Japan gets, a snazzy selection of postcards. Or art cards as I prefer to call them since I doubt anyone actually plans to put them to their intended use and they'll instead sit in a collector's hoard for eternity. Don't ask me what that Japanese text is on about. If you can read it, you might just be the person to fill KoopaTV's position of Japanese Marketing Manager! See here for details. North America was offered this spiffy Skull Kid figurine. 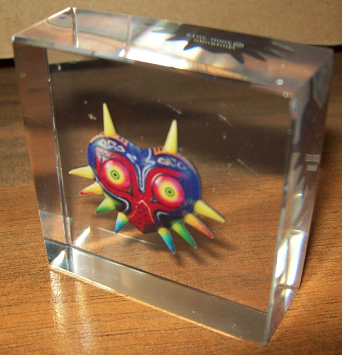 It stands 5 1/2" and has the Majora's Mask 3D logo embossed on the base, but Skull Kid's standing on it so all you can make out is "The Lege of Zel Majora's M". The base is also hollowed out, which makes the fig very top-heavy. 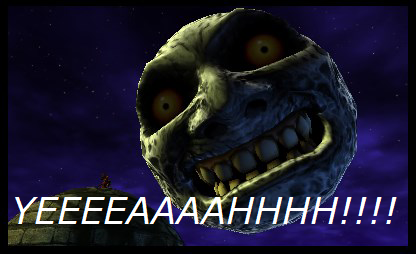 I've managed to confirm, for curiosity's sake, that there's no actual Skull Kid face behind the mask. It's good quality overall however, and looks great alongside amiibos. If I had any amiibos, that is. A steelbook (metal alternative to the basic game box). It has a wonderful sheen to it and the vivid mask design stands out well in low-relief. A double-sided poster, featuring some of the new artwork. 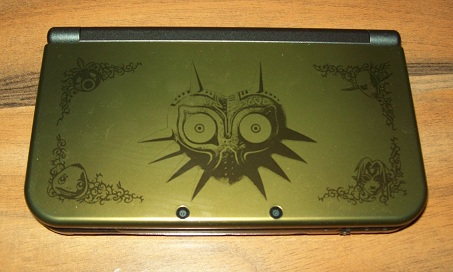 One side shows Skull Kid with an elongated shadow. The reverse, well, you may recall Ludwig saying that the art of Fierce Deity Link with Majora's Incarnation and the Moon Children was wasted on a jigsaw puzzle and should've been a poster. Well guess what the other side happens to be? The poster comes folded, which was a concern to some due to creasing. Unlike, say, the cloth map in the Skyward Sword gold Wii remote package, this may not so easily straighten out. But honestly, it's nothing a quick go over with an iron won't sort. A metal Majora's Mask pin badge. This thing is chunky and feels quality; none of that flattened rubbish here. It even comes in a presentation box not unlike something you'd put an engagement ring in. Just... don't go proposing with it. This pin is also available in the US, provided you... wait, what? Pre-order Code Name S.T.E.A.M. at GameStop? For real? Yes. You'll have to pre-order an entirely unrelated game if you want to get your hands on one of these nifty pins. A little shady if you ask me. And finally, the game itself. Unlike Ocarina of Time 3D, the box art this time is identical across the board, and features some of the game's fantastic new artwork instead of that, in my opinion, washed-out gold look the North American Ocarina of Time had to it. There were other European bonuses available too. Pre-ordering the standard edition at UK retailer GAME (essentially the UK's answer to GameStop) netted you this handsome paperweight. As you can tell, its facets give the impression of more than one mask and reverse the image depending on which side you're looking from. It's a neat trick and I'm not even sure how it works. Its size may look impressive but take it from me when I say this thing is only just larger than a small matchbox. As with the postcards, I wouldn't recommend actually using this as a paperweight. You'll want something beefier. 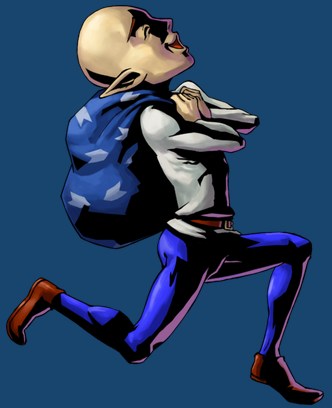 Besides all that though, the bog-standard bonus for most European retailers was a ball chain Majora's Mask necklace and a sack emblazoned with the game's logo in silver. There's a stock pic since I don't actually have them. Not terribly impressive compared to everything else... and yet that bag is STILL a damn sight better than the black-on-black nonsense on offer from Club Nintendo. This release is what all true warriors strive for! Yeah, I don't really get those complaints. 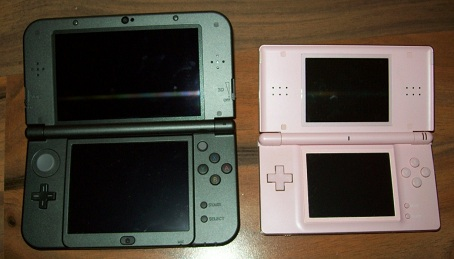 As you can see in this comparison with my DS Lite, the N3DS XL is quite a beast. I honestly now feel all is forgiven over Europe never receiving the Midnight Purple 3DS, which would've been my dream come true. This though? I'm chuffed to bits with it. I still would've preferred purple, but then I prefer everything purple. Still, the treatment of North America in all this has been a bit daft. First it was announced that the regular size N3DS wouldn't see release there at all. Nintendo of America didn't completely rule out the possibility of later releasing the standard N3DS, but said issuing just the XL made the most business sense. I can understand if market research said North America preferred the XL, but does that then mean flat-out forgoing the standard size? Are North American gamers' hands really that much larger than Europeans'? I guess everything really is bigger in America! I'm joking of course, but alas, this wouldn't be a problem if Nintendo didn't insist on having region locking on their hand-helds lately. But as if that kick in the teeth wasn't enough, here's one to the crotch: in both Japan and Europe the MM N3DS XL comes with the game pre-installed, but in North America it is conspicuously absent. Why? I can't fathom. A limited edition console branded around the upcoming release of a game... doesn't actually include said game with it. Monster Hunter 4 Ultimate's N3DS XL bundle isn't pulling this, so why is Majora's Mask? Because they know you'll go out and cough up for it anyway? I don't know... Never attribute to malice that which is adequately explained by stupidity. ...And I just realised that from accumulating all this stuff I now own three copies of Majora's Mask 3D... *Ahem* But it's all strictly for, uhh... journalistic review purposes you understand! Don't say I won't go above and beyond to bring you an honest assessment of as much of this gear as I could get my tiny European hands on! If you still doubt that North America is getting shafted, consider that the Skull Kid figure included in the North American special edition is available in the UK with the MM N3DS XL when bought from the Nintendo Official UK Store. Yes, the sole bonus that comes in the North American bundle is being made available in Europe. Whereas if you want anything out of the European set, again, go pre-order Code Name S.T.E.A.M. at GameStop. Yay(!) 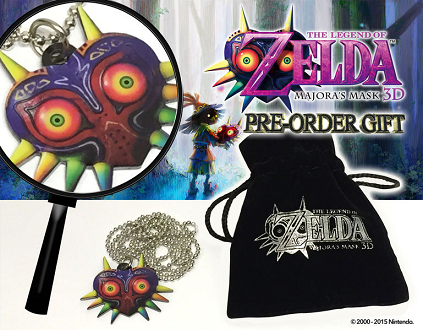 Not only that, but I guess the supply of Skull Kid figs outstripped the number of MM N3DS XLs, because those in the UK that bought a N3DS Ambassador Edition were also later added to this offer for pre-ordering the game. I'm all for making this stuff available to as many people as possible, but it must be galling for people to see the one thing that makes their special edition unique readily available elsewhere. To make matters worse, the looming menace of scalpers descended on the various Majora's Mask limited editions as soon as they went on sale, a problem that's been plaguing supplies of amiibos and other sought after goods for some time. As time wore on it became increasingly clear a good deal of the available stock was being consumed by people with more money than empathy who planned to resell them on places like eBay and Amazon for vastly inordinate sums, with some game bundles going for as high as $490 including shipping. "I'm not doing anything suspicious... Really!" That example, right there? $692 at current exchange rates. The effect of all this wasn't felt quite so badly in Europe, though that's not to say it didn't happen or that the stocks didn't sell out fast. It was just on a scale of days rather than hours. Now, at the risk of inviting more death threats than any KoopaTV staffer has ever received before, I'll admit, I'm not above buying multiple copies of something that's sought after in order to flip it for a profit later. Heck, I still have my new copy of the World of Warcraft: Wrath of the Lich King Collector's Edition, which currently sells for six times what I originally paid for it. HOWEVER, the difference is that I'm talking about maybe one extra copy of something in this price range, two maximum. Not dozens or even scores as in some of these cases. Secondly, if I plan to resell something, it'll be on a scale of years after the purchase, and not IMMEDIATELY LISTED ON EBAY. So yes, I'm not completely against the practice in principle; I'm a capitalist, dammit. But this is way, WAY beyond that. This plundering of large parts of the inventory only exacerbated the already high demand to the point where some retailers, including Best Buy and Fry's, had to cancel certain pre-orders due to overselling. Even, depressingly enough, at the last minute. Some retailers, like the aforementioned Best Buy and GameStop, have been limiting sales to one or two per household. It's a sad state of affairs to see it come to that, but what can you really do in the face of such evil? Vortexica doesn't want to see other regions under the yoke of gaming neglect that Europe was historically under, even if they've had it good for years. Nor does he wish to see scalpers have their way with you! Just say NO! As well, Vortexica now has an NNID! You can... "follow"? Yes, follow him on Miiverse at Vortexica! ...Or follow him on Twitter @Vortexica if that's more your style. Vortexica then attends the Symphony of the Goddesses concert, and proclaims that Majora's Mask is his favourite Zelda soundtrack. Although I haven't bought it yet, I intend to play Majora's Mask 3D since I missed the original. ...you can always get the Virtual Console version. Why would I get the VC version when I could get a NEW version? I deliberately didn't buy the VC version for years because I was holding out for a 3DS version. In my view, MM3D is definitely worth it (especially for those who haven't played the game before) even if a few of the alterations have been questionable, something I'll go into in greater detail if I ever get around to reviewing the thing. At the very least, the ability to play it at a more modern frame rate makes the remake appealing. The only benefit of the VC version that springs to mind is if this is just the kind of game you prefer playing on a console over a hand-held.